Special Post: We Have A New Toy In The Store! Get this sleek new versatile pocket-sized tool PLUS a super secret magic prop known only to a few underground magicians ... and a bonus! People say the pen is mightier than the sword. Maybe. No one really knows; only one thing's for certain: Combining both is better than everything in the Universe. That's right. A pen that's also a sword. Now we're talkin'. Simply pull apart the halves of the pen, and you've got a sharp serrated blade at your fingertips! It's everything you want in a pen that's also a knife: sharp, sleek and capable of writing. Use it to cut a rope, slice some soap, poke the Pope, or write a note! OK, so maybe it's best if you didn't actually poke the Pope ... or yourself either for that matter. This thing is really sharp! Oh yeah, this bad boy is serrated, so you can do even more with it! You can cut through twine, slice bread, saw through a zip tie ... shoot, you can probably whittle with this thing! And when inspiration suddenly strikes you in the midst of these creative activities and you want to write your thoughts down, the pen will be right there waiting for you. Now I know what you're thinking. This epitome of cylindrical badassery probably costs $50, right? Wrong! It's $55! Just kidding. Get this: You can get your very own Penmanshiv for just $14.99. But wait, there's more. Here's where it gets pretty heckin' awesome. Did you see this week's Scam School? This episode features an incredibly visual routine that makes use of a special erasable highlighter we call The Heatlighter. No, wait. The Lowlighter. Hmmm. The Byelighter? We'll workshop it, but in the meantime, the important thing to know is that the best Erasable Highlighter out there is available at Scam Stuff right now for $5.99. This erasable highlighter allows you to take your magic to a whole new level. Imagine being able to cause ink to APPEAR in the blink of an eye? The special ink in this highlighter responds to heat by appearing rather than disappearing. It's like the opposite of the Frixion pen. Think of the possibilities that are available to you when you have both! You can even mystify other magicians with this one. This item is not widely known yet, which means now's the best time to get the most use out of this principle. Now before I go any further, are you sitting down? OK, great. Here's the deal: While supplies last, you can get both the Penmanshiv and the Erasable Highlighter together for just $15.99. PLUS, we'll even throw in a Frixion pen. It's the ultimate pen bundle! No wait, The Penultimate Bundle! Nailed it. One more time: that's the brand new Penmanshiv with its hidden serrated knife, a Frixion pen that you can use for countless tricks and effects, and the top-quality Erasable Highlighter that will take your ink-based routines to the next level, all for just $15.99! That's like half off! Here's the catch: these just arrived at the warehouse, so we're going to need about a week to package them up and get them out the door, but we've got a few ready to go right now ... so if you're one of the first 50 orders, we'll ship yours out immediately! Take Me To The Penultimate Bundle! 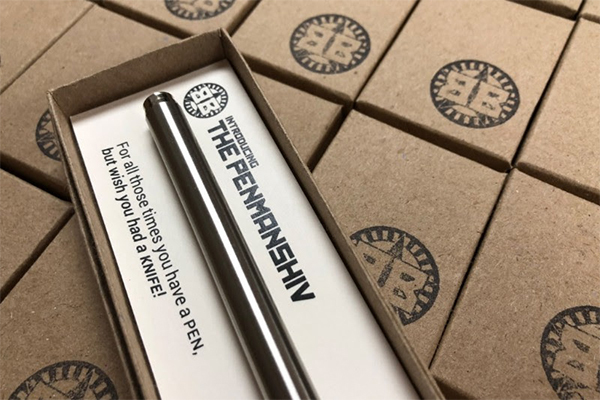 We had a great time making that video and look forward to hearing about your adventures using The Penmanshiv in the wild. Remember, be careful! And don't poke the Pope! Also, be sure to send me your ideas for routines using the Erasable Highlighter and the Frixion pen. I know you're going to think of things so amazing I'll be forced to start using the word "flabbergasted" again! PS: That's the brand new Penmanshiv with a stealth blade for whenever you need it, the Frixion Pen that enables hundreds of amazing effects AND the super underground Erasable Highlighter so you to take your magic to the next level (and even fool magicians) -- all for half off at just $15.99! Jump in today!